Casita Cerveceria is a contract brewery (funny and yet welcome that they don't go for the formerly trendy "Gypsy" designation) mostly based at Hill Farmstead. Let that sink in for a moment. It turns out that brewer Ryan Witter-Merithew has a long history with Sean Hill, having collaborated on Hill's initial run of Grassroots beers in Europe as well as working together at Denmark's Fanø Bryghus. Heck, rumor has it that Hill considered him a sort of unofficial successor in case of tragedy ("I told my brother Darren that if I died or something he should reach out to Ryan and have Ryan take over the brewery."). After a stint at England's Siren brewing (where he again collaborated with Hill Farmstead on that Lemon Cello IPA), Witter-Merithew returned to the US to work at Hill Farmstead for a spell, and now he's heading up his own operation, using some of the excess capacity from Hill's recent expansion. My one prior exposure to Casita Cerveceria beer was something I didn't even realize at the time, a collaboration with Stillwater called On Fleek, a big 13% Imperial Stout that was wonderful (I neglected to take notes whilst drinking because I was not expecting it to be anything particularly special - I was wrong, because I am the worst). Beer Nerd Details: 5% ABV bottled (375 ml). Drank out of a wine glass on 9/16/16. Brewed in May 2016. Two beers, two winners. So yes, this is a brewery to look out for. I know I will be hunting down more as soon as possible. Alas, I only have more of this beer readily available. I know, boo hoo, right? This page contains a single entry by Mark published on September 22, 2016 11:01 PM. Burlington Chunky was the previous entry in this blog. 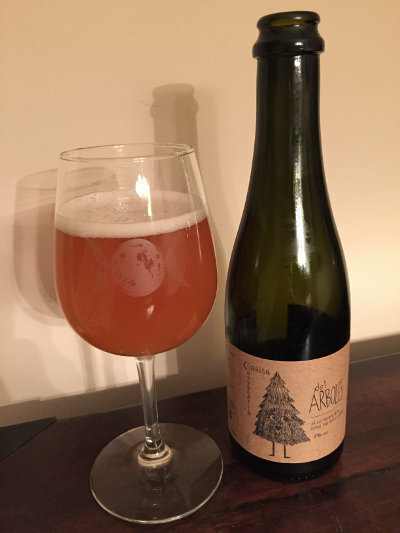 2SP Chardonnay Barrel Aged Tripel is the next entry in this blog.